As November began I was inspired by a fellow blogger to show my gratitude through daily postings reflecting on the good fortune in my life. I was posting with regularity until my trip to San Francisco with my daughter. The good news is that grateful moments were not lacking. In fact, they were abundant. I was having such an amazing time I was too exhausted to write at the end of each day. More good news . . . even with my vacation slow down, I am writing much more often, which was part of my blog improvement plan. Yay!! Since I’ve started this focus on the positive, I do see its presence grow in my life a little bit every day. It was certainly evident on the first morning of our trip. Our hotel was situated just outside the gates of Chinatown. We couldn’t resist making the historic neighborhood our first adventure. Every experience, every encounter that morning was simply beautiful. We took pictures as we walked, and talked as we browsed the many shops, marveling at the large quantities of goodies on the shelves, and baskets full of tiny trinkets. I especially loved the sight of Fortune Kitty, or its literal name, the Beckoning Cat, in every storefront, and for sale in every store. In some cases there were hundreds of the waving felines in all shapes and sizes, red, white, and golden. 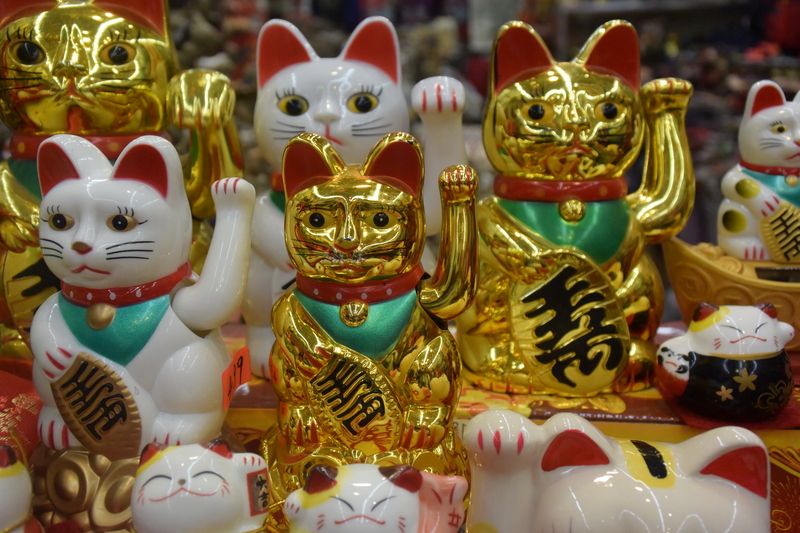 Known to bring good fortune, these welcoming kitties certainly beckoned me. Smiling, I photographed them, wanting to believe in their magic, pondering the possibilities of the luck they may send my way. Imagine. . . I began these gratitude postings because of my tendency to dwell on what is lacking or wrong in my life. Recognizing good fortune is, was, difficult for me. Making gratitude a habit has been a good thing, saving me on my toughest days. I have learned that I can always find something for which I am grateful. For sure, life would be a lot easier if a lucky kitty filled my days with good fortune. But, I’ve been thinking about the kitty . . . and I’ve been wondering . . . maybe . . . when she beckons, it’s because she wants to say . . . You have much good fortune in your life. Sometimes you have to look a little closer, a little harder, but it’s always there. Acknowledge it and give thanks, your life will be better. You had to mention kitty? Glad the trip was great and SF was good to you. Great posts. I hope you bought one as a reminder of your fortune and have it by your bed so you can see it first thing every morning.